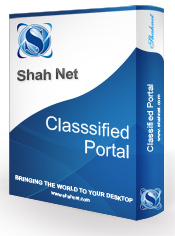 The classified portal designed by Shah Net is the top – notch classified portal in the online classified industry. We have designed the portal looking all the aspects of the classified industry. The classified portal designed by us matches with the features provided by famous portal in UK – gumtree.com. Online Classified Advertising is a modern trend in online marketing as it facilitates prospective buyers and sellers a platform to meet and perform business activities effortlessly. Online advertisements are posted by the sellers for their products or services. These advertisements are placed at proper categories for quick and easy viewing. The sellers have the choice to post the advertisements for free and also for a nominal fee to get quick responses. The buyers can view their suitable advertisements by providing their requirements. This would increase the links in your website which attracts more traffic to the website. The admin can set all the portal basic setting details using this settings module facility. i.e. Portal main email id. Add, Edit, Delete, Activate, Deactivate and View staff members. Add, Edit, Delete, Activate, Deactivate and View user members. The master management will have features to add up new data values to the masters which will be used in forms. It provides the administrator to dynamically change certain parameters of the form. The master management is used to manage adding, updating, deleting entries in state , group, attribute, category, ads. So using this master management the administrator will have the following facility. Promote any of the advertisement to “Urgent Tag on the Ad”, ”Highlight your Ad”, “Top Ad”, “Home Page Gallery”, “Premium Ad”. The advertisers are send special messages prior to expiry of their respective advertisement using cron script services. The advertisement are deactivate directly by cron scripts on date of expiry making the portal run automatically without administrator taking pain to deactivate all advertisement. The cron service makes the system robust and autonomous.